​Please contact us if you are interested in hosting a Scott Joplin Centennial concert incorporating pieces from the Piano Works Archive using a Disklavier or other playback system. 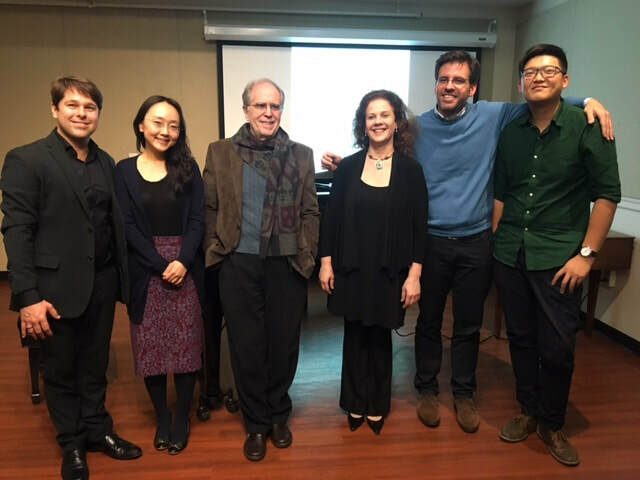 Our intention is to make it easier to fill up a program by combining whatever performances you can arrange by pianists from area with recordings made by pianists presenting a variety of approaches. October 30, 2017, 7:30 p.m.: Joplin Online Centennial Concert, Boston University, hosted by Victor Cayres. April 1st, 2017, 7:30 p.m.: Joplin Online Centennial Concert, Soundhouse A, School of Music, Ball State University, hosted by Robert Willey. Local performances by Ball State faculty and students, with recorded performances from contributors to the Piano Works Archive, including Kyle Gann's Texarkana. January 24th, 2017: Martin Luther King, Jr. Memorial Concert, Sursa Performance Hall, Ball State University, Muncie, IN. Robert Willey gave an introduction about Joplin's life and use of the eighth-quarter-eighth motive appears 123 times in Bethena, and then performed it. George Litterst and Robert Willey, "Joplin 100 Years Later!". Music Teachers National Association national conference. Orlando, March 21, 2018. Robert Willey, “100 Years of Recording and Publishing Ragtime.” Music and Entertainment Industry Educators Association Educators Summit. Chicago, April 1, 2017. On April 1, 2017, Richard Dowling performed The Complete Piano Works of Scott Joplin in two sold-out concerts in the Weill Recital Hall at Carnegie Hall in New York. Dowling is maintaining a busy schedule during the centennial year and may be coming to a concert hall near you! In the meantime, he has recently released a beautiful CD set of Joplin's complete works, whose liner notes were nominated for a Grammy Award. ​The Scott Joplin 36th Annual International Ragtime Festival was held in Sedalia, Missouri from May 31–June 3, 2017. The West Coast Ragtime Festival is having its 31st annual event in November. It is sponsored by the West Coast Ragtime Society. Check their calendar for shows throughout the year. Paul Stewart performed and commented on American ragtime and its influences at the Whitestone Retirement Community Piano Recital on October 2, 2017, with selections from Scott Joplin, Charles Johnson, Joseph Lamb, Nathaniel Dett, Felix Arndt, Zez Confrey, and George Gershwin.